Porcine circovirus type 2 (PCV2) infections may lead to the development of subclinical signs or chronic systemic syndromes, collectively known as “porcine circovirus-associated disease” (PCVAD) in swine. Interferon gamma (IFN-γ) is known to enhance PCV2 replication in vitro, and immune mediators may act as pivotal factors in triggering PCV2 infection progression toward PCVAD. We determined the effects of IFN-γ on PCV2 replication in PK-15 cells. PCV2 was cultured in the presence or absence of exogenous swine IFN-γ (swIFNγ). Growth curve analysis in PK-15 cells revealed that PCV2 could replicate to a significantly higher titer in swIFNγ medium. To investigate the host cell response upon PVC2 infection, differential expression of proteins in PCV2-infected PK-15 cells with or without swIFNγ stimulation was analyzed by proteomics (LC-MS/MS) analysis. A large proportion of the differentially expressed proteins in swIFNγ-treated PCV2-infected cells were found to be involved in apoptosis, cellular stress responses, cell survival/proliferation pathways, and inflammatory responses. We further confirmed the expression of these differentially expressed proteins at the mRNA levels by qRT-PCR. PCV2 infection in PK-15 cells in the presence of IFN-γ resulted in upregulation of cellular proteins in responses to stress, cell survival, and cell proliferation (Hsp90, MAP3K7, RAS-GTPase, c-myc, and 14-3-3 epsilon) as well as in an increase in the levels of proteins (CASP9 and TRAF5) related to the apoptosis pathways. Thus, PCV2 exploits several cellular biological processes through IFN activation for enhancing viral replication. 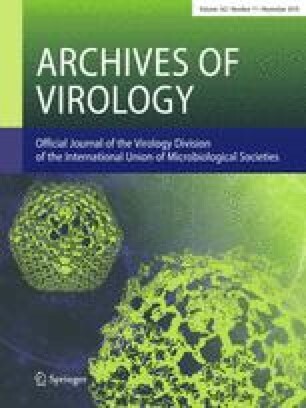 This is the first evidence of IFN-γ promoting PCV2 replication in vitro via a mechanism similar to that used by several human viruses. The online version of this article ( https://doi.org/10.1007/s00705-018-3944-1) contains supplementary material, which is available to authorized users. We thank Prof. Dr. Prem S. Paul and Dr. Igor Morozov for providing the plasmid p31/31, Prof. Dr. XJ Meng for the gift of PCV-free PK-15 cells, and Ms. Vasinee Srisombundit for technical assistance. This study was supported by the Thailand Research Fund (grant number RSA55080036), the Kasetsart University Research and Development Institute (KURDI) (grant number MoWo33.55), and in part by a grant funded under the program Strategic Scholarships for Frontier Research Network for the Joint Ph.D. Program Thai Doctoral Degree from the Office of the Higher Education Commission, Thailand. Pattama Mutthi declares that she has no conflict of interest. Sirin Theerawatanasirikul declares that she has no conflict of interest. Sittiruk Roytrakul declares that he has no conflict of interest. Atchara Paemanee declares that she has no conflict of interest. Chalermpol Lekcharoensuk declares that he has no conflict of interest. Payuda Hansoongnern declares that she has no conflict of interest. Nantawan Petcharat declares that she has no conflict of interest. Nattarat Thangthamniyom declares that he has no conflict of interest. Porntippa Lekcharoensuk declares that she has no conflict of interest.